This project has been undertaken by a fledgling railway preservation society with a limited running line (1 mile) and situated alongside a footpath on the formation of the former Deeside Railways. This railway line originally ran from Aberdeen to Ballater and was constructed in stages over a period from 1853 to 1866 eventually being absorbed into the Great North of Scotland Railway in 1876. There have been two stations at Crathes, the first, Castle platform (and closer to the Castle) was replaced in 1863 by the second which finally closed in 1966. No station remained so the Society had to construct their own. Following absorption the GNSR had constructed many stations to an identical design and that at Pitfodels, now a private residence, still exists. However that station was not available and the Society was aware that the building at Oldmeldrum (1895) was another, disused, building of the standard GNSR design. This building was in poor condition and surrounded by subsequent development. There then followed a long process (12 years!) seeking "Grade C Listed status" for the building thereby allowing Heritage Lottery Funding, obtaining the various Consents for dismantling and planning permission for the new site. Eventually all these were obtained as was the station building for £1 ! Dismantling required the building to be carefully cut into sections, transported to its new location and conservation work to be undertaken on the wall and roof structures. As little as possible of the old structure was replaced but years of disuse, and being without proper foundations, had led to the lower sections of the wall panels rotting and needing to be replaced. The small band of dedicated volunteers toiled and has managed to re-assemble a building that looks superb. Whilst the building no longer sits on a platform constructed from granite blocks it is imposing especially from the rear where the terrain and disabled access have required a long gradual ramp be constructed. This building has been meticulously restored from near dereliction and is now a rare survivor of a GNSR station. Wherever possible original materials have been reused and its appearance actually belies its age. What appears to be almost a reconstruction is actually a largely original structure. The soundness of the approach, even allowing for its Grade C status, is exemplary. Due to theft the lead roof capping has been replaced by zinc but the change is now hardly noticeable. Slates, timber cladding, doorway profiling are all as original and great trouble has been taken to research and locate replacement materials as near to the originals as possible. Even the two end rooms, that are complete replacements as the originals were too far gone, are almost exact replicas of the originals with only minor alterations to make them suitable for modern requirements (insulation in particular) and allowing for better roof drainage. The final results are amazing for such a small band of volunteers, (about 12 active members and a total Society membership of 200) with much attention given to sourcing appropriate wall cladding, window glass, guttering and rain water downpipes. The colour scheme is a matter of conjecture as no definitive colour scheme on the building was established. However the chosen colours look well and enhance its highly visible location: this area being very much on the tourist trail of Scotland. 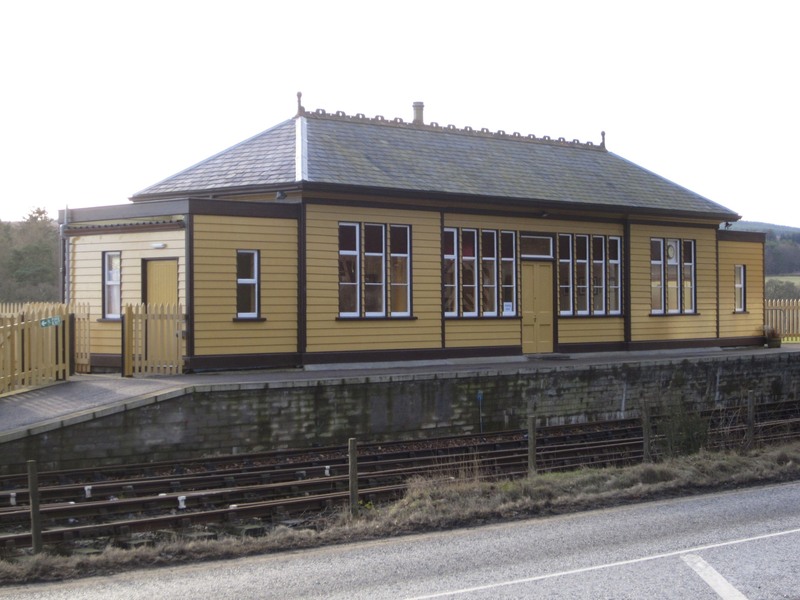 A wonderful little railway station building has been conserved and given a new lease of life and, though relocation is often undesirable, this building is unlikely to have enjoyed a future had it remained in its Oldmeldrum location. 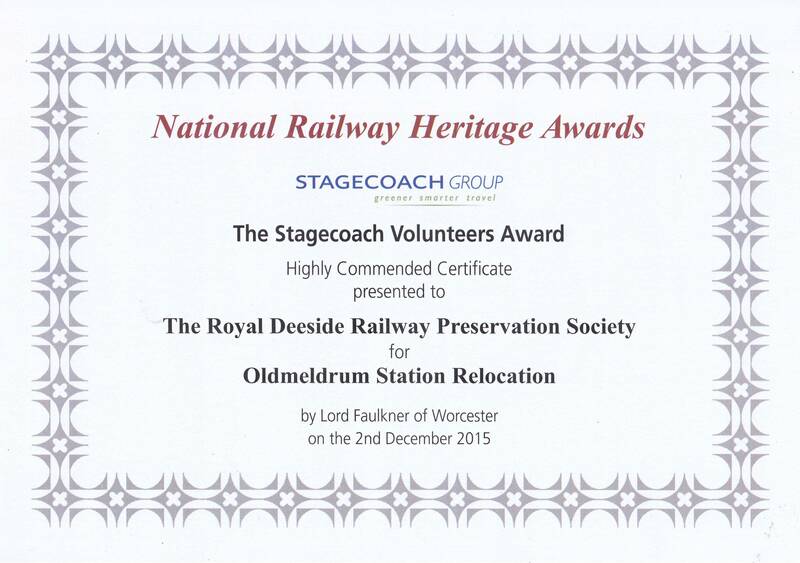 In 2015, the station building at the Milton of Crathes that had been relocated from Oldmeldrum was entered into the National Railway Heritage Awards competition, and gained a 'Highly Commended' award. 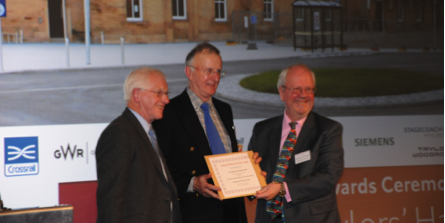 The presentation of the award to the Society was made by Lord Faulkner of Worcester in the awards ceremony in Merchant Taylors' Hall in the city of London. 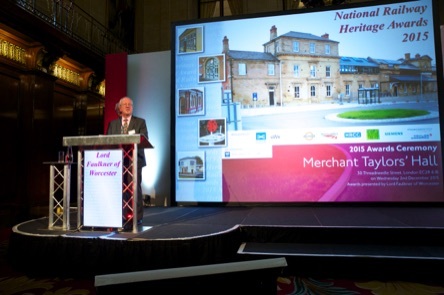 Courtesy of National Railway Heritage Awards and Duncan Phillips, photographer.